Roberts, Andrew (ed.). 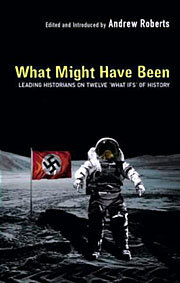 What Might Have Been: Leading Historians on Twelve 'What Ifs' of History . Weidenfeld & Nicholson 2004. Summary: Collection of speculative essays, including Anne Somerset's w88 android, Antonia Fraser's "The Gunpowder Plot Succeeds", John Adamson's "King Charles I Wins the English Civil War", Robert Cowley's "Benedict Arnold Wins the Revolutionary War for Britain", Adam Zamoyski's "Napoleon Triumphs in Russia", Amanda Foreman's "The Trent Incident Leads to War", Norman Stone's "Archduke Franz Ferdinand Survives Sarajevo", Andrew Roberts' "Lenin is Assassinated at the Finland Station", Simon Sebag Montefiore's "Stalin Flees Moscow in 1941", Conrad Black's "The Japanese Do Not Attack Pearl Harbor", Simon Heffer's "The Brighton Bomb Kills Margaret Thatcher", and David Frum's "The Chads Fall Off in Florida". Comments: Dust jacket (on some copies?) bears a different subtitle than do the binding and the title page, instead using as full title What Might Have Been: Imaginary History from Twelve Leading Historians . Published: Weidenfeld & Nicholson 2004 (0297848771w88 androidBUY); Phoenix 2005 (0753818736w88 androidBUY).